Home » Uncategorized » Who is Snaro? Who is Snaro? If you are a bowhunter Snaro is the ultimate small game head for small game from quail to pheasant sized game. Snowshoe hare, cotton tail rabbits, and grey squirrel are also no match for a well placed shot with a Snaro from Snaro.net. 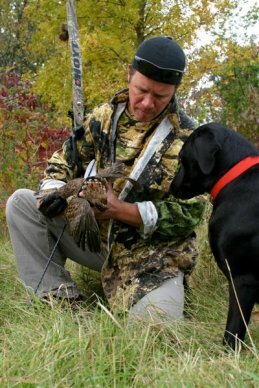 I have shot a lot of small game with a Snaro from both a recurve and a compound, both ground dwelling small game critters and game birds that are fast enough and tough enough to fly away from a heavy load of shot from a 12 guage shotgun. The Snaro excels in all sorts of weather/cover conditions for an archer. A Snaro will not allow an arrow to burrow under deep snow or ground cover. When I mention Snaro around some of my fellow archers there’s always one who asks “who is Snaro?”. With a few Snaros from Snaro.net my pals and I get to extend our archery season, lose fewer arrows, find ourselves improving our range estimation and stalking skills, and have a heck of a lot of fun doing it. Go to Snaro.net, find out for yourself “who is Snaro?”. Invite a few archery minded friends over on a Saturday afternoon and shoot some aerial targets. You will find your reaction times and quick range estimation skills improving, and your confidenece levels soaring. With a flu-flu arrow tipped with a Snaro you will find your archery season stretching a few months longer and your overall archery skills improving at every outting.